Please contact me if you would like further information on any publications listed below. Panel discussion at 2006 MIT Sloan CIO Symposium on "software as a service." See also a description of the session. As a Research Affiliate of the MIT Energy Initiative working on the Future of the Electric Grid, I participated in various events about our research. I testified before the Federal Communications Commission field hearing on Energy and the Environment (I am introduced at 51:02 and give my testimony at 1:03:12) [See also FCC Field Hearings page (see November 30, 2009). 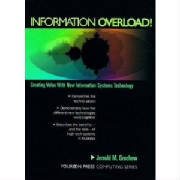 Information Overload! Creating Value with The New Information Systems Technology. My first book, "SAA - A Guide to Implementing IBM's Systems Application Architecture" is available from me or through a variety of on-line used book sellers. The following articles were available via the Internet archive the last time I checked. I wrote a series of articles in the 1990s when I was Chief Technology Officer at American Management Systems (now merged into CGI). Few of these articles are available online but are listed to give you an idea of the topics I am interested in (or was interested in at the time I wrote them). Please contact me if you would like a copy of the text. In case you aren't familiar with "tohubohu," this article cited as the example in Wordsmith's "A Word A Day"
...and wrote comments for the Report of the Software Productivity and Quality Issues Task Force of the Information Technology Association of America.